DEFINITION of ‘RUB (Russian Ruble)’ The RUB is the currency code for the Russian ruble (RUB), the currency of Russia. 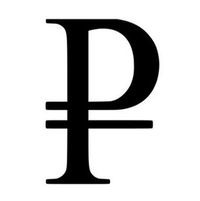 Ruble currency symbol. The symbol (sign) of the ruble is an abbreviated graphic designation of the word “ruble”, i.e. symbol of the ruble. If the first mention of the ruble appeared in the 13th century, the first mention of the abbreviated sign of the word “ruble” appeared only in the 17th century. The name of the monetary unit for 800 years remained unchanged and reached our time, but by the end of the 18th century the graphic symbol (sign) of the ruble had lost its main purpose and was not officially mentioned any further. At the end of 2013 (December 11, 2013), that is, literally 6 days after the end of the voting, the Bank of Russia approved the graphic designation of the Ruble (the Ruble symbol). Approved the second option – in the form of a capital letter “P” of the Cyrillic alphabet, supplemented at the bottom with a horizontal bar. In addition, you can copy or download the ruble symbol on the Bank of Russia website.